LIC Jeevan Lakshya (Table 833) is third launch by LIC in the month of March, 2015. LIC Jeevan Lakshya is limited premium endowment plan with profit. LIC Jeevan Lakshya policy is designed to provide annual income benefit to the policy holder family. Under this policy 10% of sum assured will be paid to nominee on every policy anniversary in case of unfortunate death of policy holder till maturity. On maturity again sum assured and bonus will be payable. 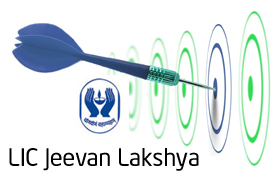 Let’s take a closer look at LIC Jeevan Lakshya. On unfortunate death of policy holder during policy term 10% of basic sum assured will be paid to nominee every year from year of death till maturity date of policy. If policy holder survives policy term and all premium dues have been paid then at the maturity following shall be payable. LIC Jeevan Lakshya provides following optional riders benefits on payment of extra premium. This rider benefit can be opted any time within premium paying term of policy. Accidental benefit risk cover is applicable during policy term only. If this rider is opted amount equals to accident benefit sum assured will be payable in case of accidental death. In case of accidental permanent disability of policy holder, basic sum assured will be divided and paid in terms of EMI spread over 10 years. Future premium will be waived off. Maximum limit for Accidental rider is 1Cr. Term assurance rider can be taken only at the time of taking LIC Jeevan Lakshya policy. Policy holder need to pay small additional premium amount for this rider. If this rider is opted amount equals to term assurance rider sum assured will be payable in case of death. Maximum limit for Term assurance rider is 25 Lac. Mr.Rohit purchase LIC Jeevan Lakshay Policy with following details. From 6th year to 20th year nominee will be paid with sum of 1 Lac every year. (10% of basic sum assured). Looking at first instance this policy seems to be attractive, however premium details are yet not available. I will update this post as soon as will get information about premium. How you find LIC Jeevan Lakshya? Do share your views.